Field work for the winter atlas is well under way. The goal is to spend approximately 10 hours surveying each block during November-December and then another 10 hours during January-February. If you’ve not yet begun, consider using the Thanksgiving break to make a plan and start your surveys. The core data collection involves conducting a series of timed 1-hour surveys in varied habitats throughout your block. If you are unsure where to begin, start by identifying up to 10 sites where you think you can spend an hour birding. These sites should span the range of habitats in your block to maximize the variety of species that you will find. They also should not simply be the places that people think of as “good” birding sites, because we want the atlas data to represent the full range of conditions found in the state. For example, the map below shows block 40D, which includes most of the UConn campus. 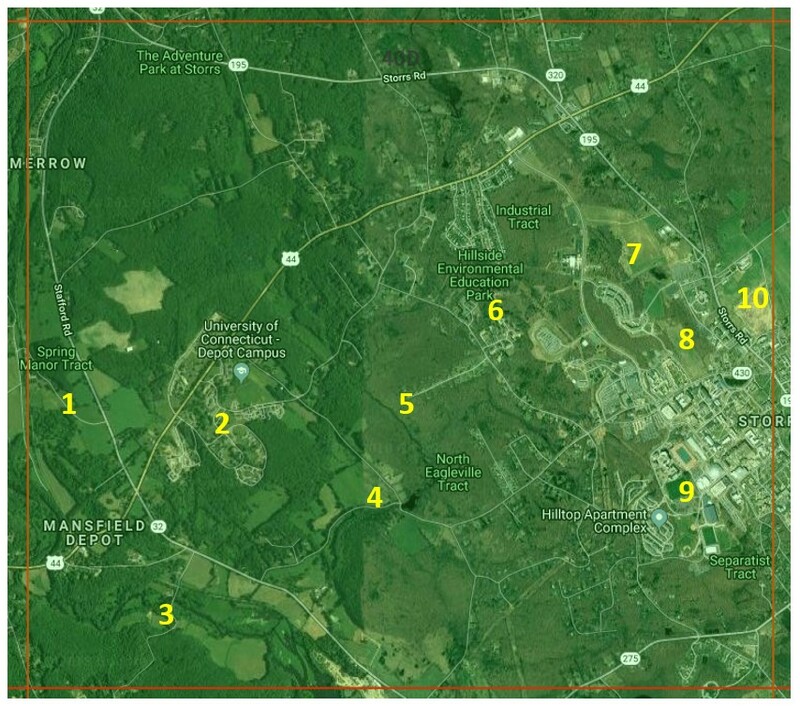 In this block, I’ve picked some well-known birding spots – the Lot W fields (#7) and the west side of Horsebarn Hill (#10), where I expect to find interesting species unlikely to be found elsewhere in the block. But I’ve also picked sites that include deciduous woods (#5), a hemlock stand (#3), and a wooded swamp (#6), where I might find additional species, and to represent these other habitats. My list also includes the built-up main campus (#9), and the more run-down depot campus (#2) to ensure that I get some data from areas with a greater human footprint. With this selection, I am clearly missing large sections of the block, but these are mostly habitats that are similar to those at the sites I have picked. For example, the large forested area in the northwest quarter of the block is not very different from site #5. Since I know this area well, I do know that there are a couple of species I might miss if I only visit these ten sites. So, I will probably make some quick additional visits to a couple of spots where I’ve heard great horned owls before, and record whatever I find as incidental observations. There’s also a stand of trees in the northeast corner where 100s of robins roost in some years, and I will also check that out to see if there are birds present. If the site is being used, I will make some evening visits to conduct winter roost surveys. And, finally, there are two small lakes on campus, so anytime I walk by one of them I take a couple of minutes to quickly look for ducks and other waterbirds and submit the the results as a waterbody survey.